Provide comfort for the family of Mrs. Enni Mickelson with a meaningful gesture of sympathy. 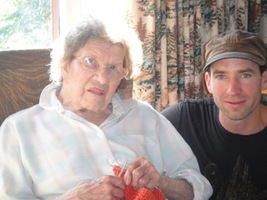 Mrs. Enni Mickelson, age 97, resident of Thunder Bay, passed away peacefully on Friday, December 28th. Enni (Korte) was born in Ylivieska, Finland. Her mother, Emmi, travelled to Canada in 1929 to join Father Jack. The Korte's homesteaded in Jacques Township, Korte Road, and other sites around Lappe. Jack worked in the Forestry Industry while the family farmed. Enni worked hard all of her life: the Hoito (where she met her husband Toivo), Zellers, owned and operated Arnold's Better Value Store and she managed and cleaned St. Paul's Place. Mom, Gran, Auntie. Enni, took an incredible interest in life! She pursued all that she did with enthusiasm, energy, thoroughness, determination, and a "get 'er done" attitude. She enjoyed: her family (and especially grandson Brent), gardening, travelling, the camp at Surprise Lake, Theatre and the Arts. cross country skiing, blueberry picking, knitting, sewing, and she always had an incredible craft room, stuffed to the hilt with material and wool! And those Cinnamon Buns she baked, Wow! Enni's first and foremost love however, was St. Paul's United Church. She knew better than anyone in the Congregation to: take the lead, organize, delegate tasks, and to be "hands on" at any event : rummage sales, funeral sandwiches, dinners, bible studies. Not long ago, St. Paul's honoured Enni with a luncheon and a lovely plaque for 50 years of Dedicated Service. grandson Kyle Mickelson; special nieces, Donna (Victor), Joanie (Reid) and most Dear to her Heart, Lynda Mckeown. 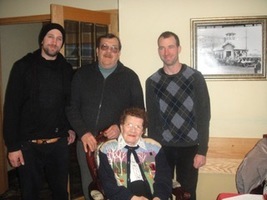 Enni was predeceased by parents, Jack and Emmi Korte, husband Toivo, son Robert Mickelson, and grandson Brent Mickelson, brother-in-law, Norman Flavell. Funeral Services will take place as follows. Interment with Family only (Lappe) followed by the Celebration of Enni's Life (Church Service) at St. Paul's United Church, Waverley Street, on Thursday, January 3rd, 2019 at 1:00 pm. Reception at the church to follow. Heartfelt thanks to all of the doctors, nurses, and staff of Bethammi on Carrie Street! So much conscientious caring, so many kindnesses,so much really special hard work. Thanks too, to Enni's special lunch ladies. Harold and I will miss you. To plant a memorial tree in honor of Mrs. Enni Maria Mickelson (Korte), please visit our Heartfelt Sympathies Store. We encourage you to share your most beloved memories of Mrs. Enni here, so that the family and other loved ones can always see it. You can upload cherished photographs, or share your favorite stories, and can even comment on those shared by others.